Today’s students are the next generation of American doers and thinkers. The most diverse population ever, they have the honor and the burden of keeping the United States on the forefront of innovation and social progress. 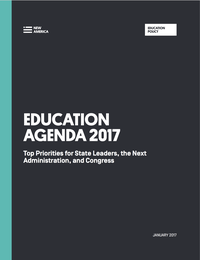 To ensure students can succeed, our country’s publicly-funded education system—from early learning to public schools, and through higher education and workforce training—must be strengthened. So far, this system has failed too many of our country’s young people—turning them off of learning before they exit elementary school, leading them to repeat grades or drop out, requiring them to engage in costly remediation, and more. Widespread disparities are festering between students from high-income and low-income families; racial justice is still wanting; and linguistic diversity is still seen as a challenge instead of an opportunity. Expand access to quality early learning. Smooth transition points from pre-K through higher education and into the workforce. Transform the preparation and ongoing development of educators. Align research and development to educational practice. Build an infrastructure for supporting dual language learners (DLLs). Improve access to and linkages between education and workforce data while protecting student privacy. Hold “bad actors” in the higher education system accountable. Simplify and target financial aid to the students who need it most. Repair the federal-state partnership in higher education.